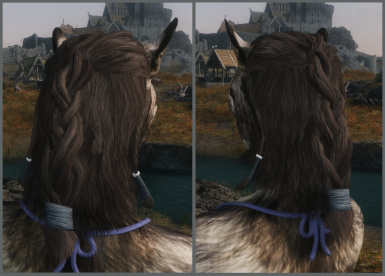 Think the vanilla hairstyle selection for Khajiit stinks? Then this mod is for you! 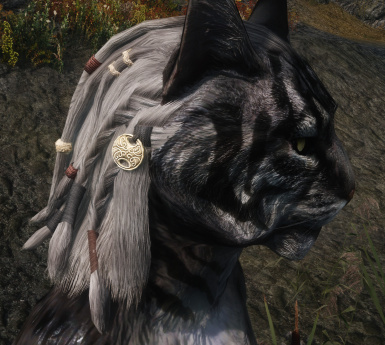 Adds a unique, highly detailed hairstyle for male Khajiit characters. Remember when I said I was taking a break from Modding? Apparently I don't do breaks so well. I was just going to quickly install Skyrim to put my new rig through its paces... And this happened. Meet the new hairstyle of my latest character, because the vanilla choices for male Khajiit are somewhere between boring and horrible. Inspired by one of the ESO hairstyles that I adore. Originally tailored towards my backstabby stealth-kitten, but now I can't help but wonder how he's ever going to sneak up on anything with all those metal bits chiming in his hair. This was going to be an evolving hairstyle, with my character adding various findings to it as he explored Skyrim. I might still do that, but probably not on a regular basis - rigging and exporting hair meshes for Skyrim is a huge pain. Also, time is an issue. So... maybe there will be an update to this mod with more options at some point. No promises, though. 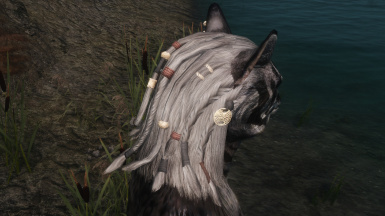 Adds a unique, highly detailed hairstyle for Khajiit characters (male only). Made for personal use, so please don't ask for conversions or other changes, I probably will not oblige. Comes in two versions, one with a set of copper earrings in the left ear, and one without. Standalone, does not replace any vanilla hairstyles. Player character only, not added to any NPCs. Textures and normals are 2k, I think that's reasonable for a player-only hairstyle. If you need a smaller size, please use a tool (e.g. DDSopt) to resize them yourself. The hair colour can be changed during character creation, but the texture is very desaturated to allow for truly white / gray hair colour. Might not work so well with the vanilla hair tints, use Racemenu for full control over hair colour. 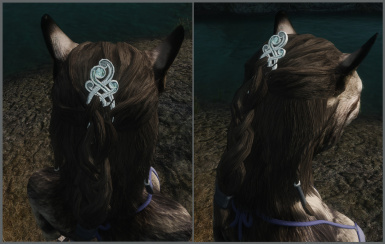 Added a new female hairstyle (braid with decorative silver comb). Intended for Ma'isha, the little Khajiit girl from this mod, but I haven't figured out how to make her actually wear it yet. There are two versions of the hairstyle, one with the comb and one without it. I might make an additional version that is more similar to the male style (with all the little bits of jewelry), but no promises. Download with NMM or install manually by extracting everything to your Data folder. Don't forget to activate the plugin file! All hairstyles will be available to choose during character creation. Should be compatible with literally anything. Hair texture is an adaption of Superior Lore-Friendly Hair. Hands down this is the best hair retexture available, and I recommend that you give it a try if you haven't already.